Nationals center fielder Adam Eaton tore a ligament in his left knee, and his season is likely over, the team confirmed Sunday. General manager Mike Rizzo said Eaton has a "full thickness" ACL tear, plus a meniscus tear and a high ankle sprain. "His return to this season is unlikely, but we don't know until the doctors get in there, and we'll see what the surgery leads us to believe," said Rizzo, who added the surgery date is not set. In Friday's 7-5 loss to the visiting New York Mets, Eaton, 28, stepped awkwardly on the bag when he beat out a throw to first in the ninth inning. "Just trying to make something happen," Eaton said. "Kind of got outside my zone there and lunged a little bit at the bag. It's part of the way I play, and it's unfortunate I got snake bit a little bit there." He fell down and then needed assistance leaving the field, keeping weight off his left leg. "It's probably the worst pain I've ever felt in my life," Eaton said. "When I heard it pop I thought it was my ankle, and it was my ACL it wasn't my ankle. I looked down to basically see if I saw any bones and make sure that everything's still there." Eaton, who went on the 10-day disabled list Saturday, was Washington's biggest offseason acquisition, arriving from the Chicago White Sox in a trade that included the Nationals' top two pitching prospects plus a 2016 first-round draft choice. 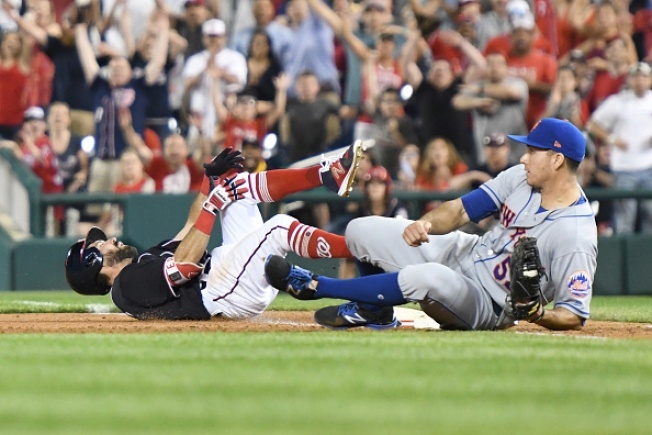 He was hitting .297 with two homers and 13 RBIs, reaching base safely in 20 of 23 games for the NL East leaders and forming an effective 1-2 punch at the top of Washington's batting order with shortstop Trea Turner. Turner, last year's runner-up for NL Rookie of the Year, will return to the leadoff spot in place of Eaton. It's a spot Turner knows well. Rizzo said the Nationals are "comfortable" replacing Eaton from within the organization. "We feel we have the personnel specifically at that position to compensate for him," Rizzo said. "It's one of the greatest depth positions we have in the organization, so we feel good about that." Michael A. Taylor will get the first shot at replacing Eaton in center field, although Nationals manager Dusty Baker made it sound as if Taylor will need to start hitting better in order to keep that job. Taylor entered Saturday batting only .095 (2 for 21), but he raised that to .195 by going 3 for 5, hitting second behind Turner. To take Eaton's spot on the roster, Washington recalled outfielder Rafael Bautista from Triple-A Syracuse before Saturday's 5-3 loss to the Mets. Rizzo noted it usually takes 6-9 months to return from a torn ACL, but Eaton hasn't given up on playing again this season.